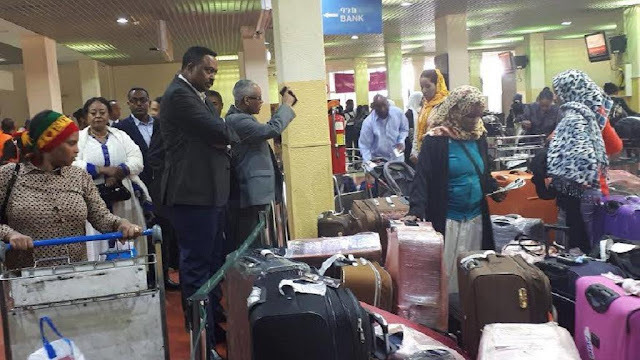 (Africa News)- Thousands of Ethiopian nationals voluntarily returned to the country from Saudi Arabia taking advantage of an amnesty program between the two governments. With barely days to the end of the 90-day amnesty program, the government’s information outfit said about 3,500 nationals had arrived in the country. The returnees all came through air transport. Photos showed a government delegation at the airport to receive the returnees. Information Minister, Negeri Lencho, told a press briefing that so far 85,000 Ethiopians had secured visas to return home. The figure is twice as much the number announced in May this year when exit visas for about 40,000 citizens was announced. He also disclosed that some returning citizens had taken other routes besides flying in. Assuring that those who left Saudi via ship and rail. Most of them are in neighbouring Djibouti and Sudan. Prime Minister Hailemariam Desalegn had months back expressed worry over the refusal of nationals illegally resident in Saudi to return despite the amnesty program. At the time the PM said he feared that the Saudi government will resort to forcibly deport Ethiopians who have refused to voluntarily return home. The period for illegal foreigners to leave the oil-producing giant started on March 29, 2017 and ends in a matter of days. Those who fail to leave will be subjected to fines or face legal measures, which include forced deportation. Most rich Middle East countries hire thousands of domestic helpers from Africa and Asia. Most of these helpers often complain of abuse from their employers.